NEXT courses: Advanced English until March 28. Conversation Course (Šnekamoji anglų kalbos kursas) in the evenings from February 26. All courses are taught by Hannah from England. Click for more info. Make the most of class time by speaking English with an experienced teacher from England. Spend your lesson time in a productive and pleasant manner! In return for your investment, you'll be exposed to authentic English materials, as well as published resources. Be corrected in a supportive manner so you can get feedback on your grammar, vocabulary, and pronunciation. Learn in a friendly atmosphere to give you the confidence to make that presentation, take a scary exam, negotiate with foreigners, or just talk to that special person in English. Whatever your motivation for learning, I will do my best to help. Read some feedback from students. The size of the group depends on the course, but you will always get personal attention. Location: P. LUKŠIO G. 17, Ogmios miestas, Vilnius. Just a stone's throw from loads of shops and places to eat. Most importantly, there is an abundance of FREE PARKING. To reach us by public transport, you have various options. From Lukšio g. (Bus 30 or 33 to Šiaurės miestelis), from Žirmūnų g. (Trolleybus 12, 17, 20, 21 to Šiaurės miestelis + a short walk), Or from Kalvarijų g. (Bus 10, 34, 35, 36, or 53 or Trolleybus 6 or 10 to Tauragnų stop + a short walk). There are orange bike stands near Lukšio g. and Šiaurės miestelis Hyper Rimi. I can invoice you or your company. Advance payment by bank transfer is preferred. Learning materials need to be interesting, engaging, and mirror the real world to help you save time and communicate more efficiently outside the classroom. I often create my own materials by adapting authentic sources, such as professional blog posts, brochures, company reports, newspapers, articles from 'The Economist', YouTube videos, etc. We will also use tried and tested activities written by professionals to practise those areas of English that often cause problems for Lithuanian learners. I've lived and worked here since 2003, and I am a life-long learner myself, so I have some idea of what you will probably find challenging. 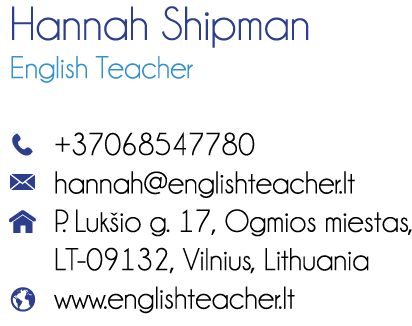 With over 18 years' teaching experience, Hannah has taught in the Czech Republic, Estonia, and Lithuania. As a language learner herself, she understands the joys and frustrations of studying. 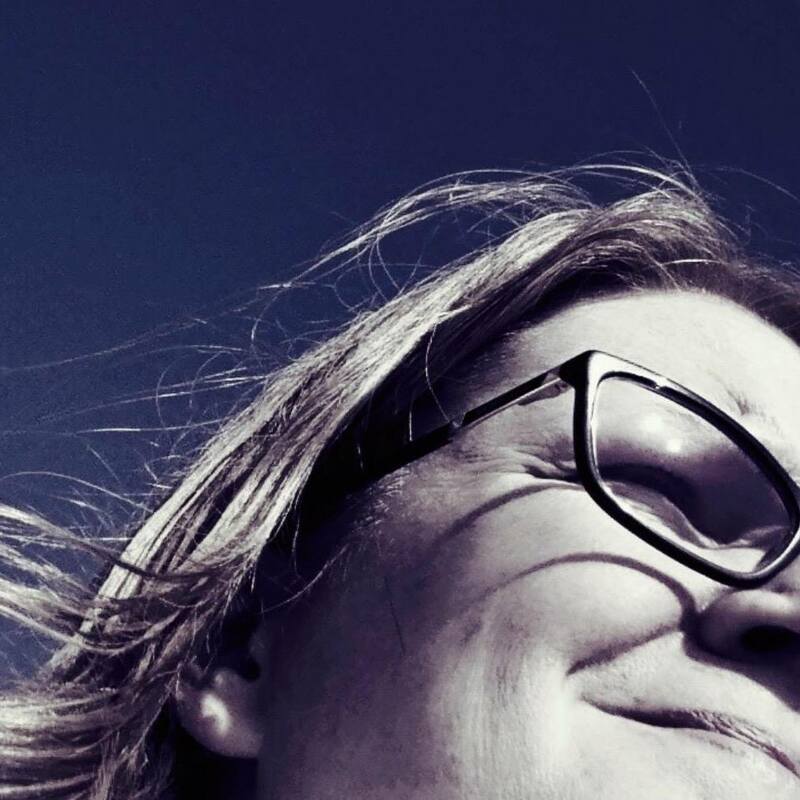 Originally from England, she holds a Master's degree, as well as teaching certificates in teaching English to adults and Business English. Hannah's interests lie in language assessment and the acquisition of lexical chunks. As well as getting involved in various random English-related projects, she also dabbles in a bit of proofreading and voice recording. In her free time she enjoys music and capturing the moment with her phone camera. Please visit the Course Timetable for all the latest information. If you want to brush up your English and learn from an experienced teacher from England, you've come to the right place! You can expect lots of feedback, error correction, and language input, especially on providing you with the vocabulary to get your message across as precisely as possible. As a language learner myself, I know that to communicate effectively, you need the right chunks of language, as well as accurate structures. Improved language skills really can open doors for you. Get in touch today to let me know what you need to do in English, and how I can help you to do it more fluently, accurately, and efficiently. As you can see, I am involved in any kind of project connected to improving the level of English here in Lithuania. How can EnglishTeacher.lt help you? All of my classes are hands-on. You will be given plenty of chance to speak in pairs, small groups, as well as with me. To improve your speaking, it is not rocket science to point out that you need to have a chance to speak! I've got loads of questions! Great, please ask away! I might not always be able to answer, but I'll do my best to find the answer. Language is not static; it's organic and always changing, which is why it is so exciting. There are also lots of 'Englishes'. I will happily answer your questions about British English and culture. During our lessons, I will expose you to a lot of new vocabulary, either through exploiting listening or reading texts or while talking to each other. I'll try and point out patterns and make sure you know how to use the new chunks or expressions. You should prioritise about 6 word partnerships to use out of class in your daily life. We'll do some activities or play revision games to recycle the expressions and help you to remember them. Tenses - they're so difficult! Sometimes it is clear which tense you should use. The fun starts at higher levels when we analyse why one tense is more suitable than another, which inevitably involves all the interesting nuances of language. What hidden information do we convey when we choose one tense over another? Fantastic. It means you are already interested in the cultural aspects of learning a language. I'll share with you the programmes I think you will enjoy watching and some useful podcasts. The first step is motivation, so it sounds as if you are in the right frame of mind to learn. If you are interested in politics, Britain, Brexit, and modern history, you might appreciate these books. They just happen to have been written by my brother! These are links to the Kindle version available on Amazon.